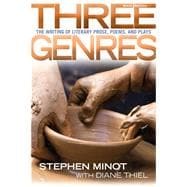 Three Genresgives students a basic introduction to fiction/ literary nonfiction, poetry, and drama and helps them to develop their creative skills in each area.#xA0; Each genre section is self-contained and includes complete works as examples along with helpful advice about how to draw on the variety of techniques they use.#xA0; The style is informal, practical, and positive.#xA0; Minot and Thiel encourage students to draw on their own experiences and develop skills on their own. Stephen Minot, Professor Emeritus of the Creative Writing Department at the University of California, Riverside, has taught creative writing for over thirty years. Over the span of his very successful career, Professor Minot authored three novels, two collections of short stories, and three textbooks including Reading Fiction and Literary Nonfiction, The Fourth Genre. His short stories have appeared in a variety of magazines and literary quarterlies including The Atlantic, Harpers, The Kenyon Review, The Virginia Quarterly Review, and the Sewanee Review, just to name a few. Professor Minot’s work has also appeared in the O. Henry Prize Stories collection and The Best American Short Stories. He is also the recipient of the Atlantic First Award, the Saxton Memorial Fellowship, and the National Endowment for the Arts Fellowship for writing. Professor Minot and Virginia, his wife, split their time between California and Maine. Diane Thiel is the author of eight books of poetry, nonfiction and creative writing pedagogy, including Echolocations, Resistance Fantasies, Winding Roads: Exercises in Writing Creative Nonfiction, Cross Roads: Creative Writing in Four Genres, and Open Roads: Exercises in Writing Poetry. Thiel’s translation of Alexis Stamatis’s novel, American Fugue, received an NEA Award. Her work appears in many journals, is re-printed in over fifty anthologies, and has been translated widely. She has received numerous awards, such as the PEN Translation, Robert Frost, and Robinson Jeffers Awards, and was a Fulbright Scholar. Thiel has taught creative writing for twenty years and is a Professor at the University of New Mexico.